After a cool September, October has been warm. Unseasonably so, according to some of the locals, though given the changing weather patterns worldwide who can be sure? Anyway, it’s been a month to enjoy warm sunshine without the blistering heat of summer. The clocks went back last night, heralding the imminent arrival of winter, but today started with a brilliant blue sky. Anna has missed out on the last few days, having unfortunately been struck down and confined to bed with a particularly virulent cold, no doubt brought here from England by family visitors a week or two back. Still, these things pass eventually. 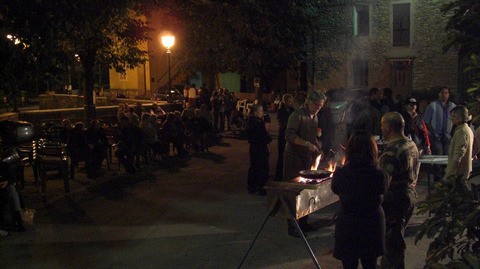 This is also the harvest season, and last night the village committee organised a “Caldarosta” (hot roast) in the piazza. 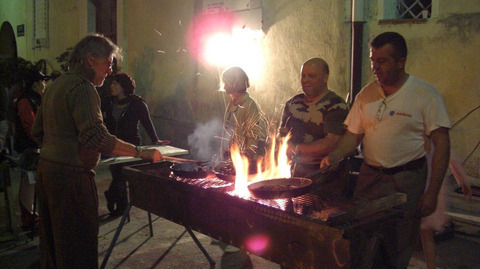 Being foreigners we had no idea what would be roasted, but it turned out to be chestnuts roasted over a barbecue and served in cornets of newspaper accompanied by plastic cups of vin brulée – hot spiced wine. A simple formula but most of the village turns out for these things, and judging by the car park, quite a few from further afield. The event is optionally free – in that honesty boxes are provided – and I have no idea how much is taken or if the costs are covered by the donations. The evening was perfect, mild and without any wind, and provides an opportunity for practising language skills, both Italian and French, the latter forming a substantial proportion of the more active village residents. 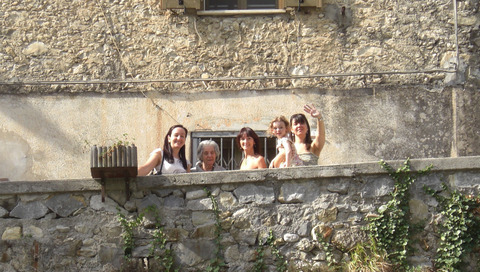 It’s sometimes difficult to be sure if people are in fact Italian or French as most of the locals are equally happy to speak either language. The barbecue in the picture was made by Guy, one of our French neighbours, who divides his time between here and a house near Lyon. Both include substantial gardens yet he manages to find the time to maintain them, producing a seemingly endless supply of superb vegetables, while simultaneously reconstructing his house and doing jobs round the village such as constructing the barbecue. He’s something of a phenomenon, formerly an in-flight engineer aboard military helicopters and a genuine all-rounder. When Guy and Noelle visited our house a few weeks back we mentioned we were planning to cut a doorway in the wall dividing us from the roof terrace. At present we have a door from the upper floor (where the bathroom is) to the shared stairwell, but to get to the terrace itself means going down and up concrete steps. The stairway is shared with the other occupants of the building who have to access the roof from time to time, mainly to set up satellite dishes. Having our own private door to the terrace will allow the room under the roof, accessed only from the terrace, to be used as a second bedroom. It also turns what’s currently a passageway into a large cupboard. Guy immediately volunteered himself to plan and execute the job and hauled me off to the local builders merchant to buy bricks with which to block the opening currently occupied by the door we’ll use to access the terrace. It’s a lot less complicated than it sounds but beyond my level of competence in matters relating to construction. My rôle will be that of builder’s mate, plus I get to ship all the materials up four flights of stairs. The bricks, a couple of bags of cement and eight buckets of sand have needed twenty trips so far. I now know why so many of the local houses have electric hoists installed in upper windows. I’ll report on progress in a future diary page.